The hype around the newly opened World Of Beer has been astounding. It's great to see a place based around beer being talked about in such a positive light. Newspapers are talking about how World Of Beer is bringing more business to the area and that people are happy to see it show that beer isn't for just drunk, ignorant people. 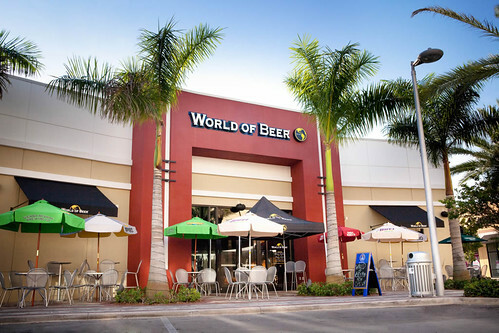 World Of Beer is celebrating it's grand opening this Saturday, August 28th from 12pm-2am. Festivities kick off at 3pm as the Mayor of Coconut Creek cuts the ribbon. Live band, Smugglin' Yo-Yo's, will be playing from 9:00pm-1:00am. There will be give-aways, free food from 160 Degrees, Fish City Grill, Lime, Scarfone's and Crepe Maker from 4:00pm-8:00pm. Abi's Place non-profit organization will be giving away 5 free cruises too. If you haven't been out to World Of Beer this sounds like a perfect time to check it out. They're open for franchise; so expect to see other WOB locations in SoutFlorida. It was just a few days back when Gerard from roadtripsforbeer.com was talking about the exploding and growing craft beer scene in Sarasota Florida. I think Florida is one of those states has been playing catch up with the rest of the craft beer culture and scene in the states here, but it's great to see that it's not only coming along...but with vengeance. In a few years I predict it to be hoppin! Pardon the pun. I took at look their menu online both drafts and bottles....what can I say...DAMN! That's one serious bottle menu and I didn't even know that you guys could get all those in your state. Report back to us by the way the more and more you try too.